For the January edition of Jets magazine, Editor Steve Bridgewater has written a comprehensive three page fully illustrated feature on the brand new, and very promising Bombardier CSeries mid-size regional jet. BTN has previously covered this important aircraft aimed at a part of the market that both Airbus and Boeing have dabbled in and to some extent have now left. Embraer is making noises in this directions too (see BTN 23 September). In an exclusive preview we feature some key elements of Bridgewater’s detailed article. Under perfect weather conditions on September 16, 2013, Bombardier Aerospace celebrated the successful first flight of its new CSeries airliner. The prototype – Flight Test Vehicle 1 (FTV1) registered C-FBCS – took off from Bombardier’s Montreal Mirabel factory at 09.55EDT and returned to land at 12.25 after a two and a half hour test flight. More than 3,000 invited guests were there to watch what was a major milestone in the CSeries’ highly anticipated development programme – but they’d had quite a wait. Bombardier hopes that the new airliner will ultimately provide commercial operators with an all-new family of 100 to 149-seat aircraft but the programme has been underway for many years and suffered numerous setbacks. The CSeries can trace its history back to the mid-1990s when Canada-based Bombardier investigated the possibility of purchasing the rights to the short haul Fokker 100 following the demise of its Dutch manufacturer. It has been a long time coming. At the control for the maiden flight was Captain Charles ‘Chuck’ Ellis, Chief Flight Test Pilot at the Bombardier Flight Test Center. Captain Ellis was assisted by his colleagues, Captains Andris ‘Andy’ Litavniks and Andreas Hartono in the roles of First Officer and Flight Test Engineer, respectively. During its flight the aircraft reached an altitude of 12,500ft and an airspeed of 230kts while testing the flap and landing gear retraction and extension mechanisms as well as conducting in-flight manoeuvres to validate the flight control system. Compared to its contemporaries the CSeries utilises ‘cutting edge’ composite materials and is said to contain 70% advanced materials (46% composite materials and 24% aluminium-lithium). This is claimed to give a 15% lower seat-mile cost than comparable aircraft as well as reductions in maintenance costs. The new jet also features bigger windows than the competition and large rotating overhead storage bins to accommodate the latest fashion of large carry-on bags. 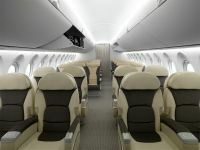 In doing so the aircraft offers the highest overhead bin volume per passenger in its class, thus allowing faster boarding and disembarkation of passengers. As these words were written the latest customer to join the CSeries club was Iraqi Airways (see in this issue), who ordered five CS300 aircraft and options on 11 more during the 2013 Dubai Airshow. The deal could be worth up to US$1.26bn if the options are converted to firm orders. As of late 2013 a total of five CS100 were in various stages of assembly and will join the flight test programme in the coming months. 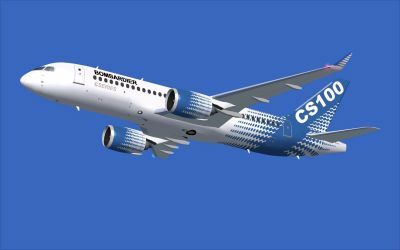 By 1 December Bombardier had booked orders and commitments for 419 CSeries aircraft, which include firm orders for 182 CSeries airliners. Some 16 customers and lessees have joined the CSeries aircraft programme and as delivery approaches others seem set to sign up, including Lion Air. The Indonesian carrier hopes to complete an order for at least 50 CSeries jets by early 2014 and, according to a report in The Wall Street Journal, the rapidly growing airline thinks it could receive its first CSeries jet in 2016. The order, if completed, would be Bombardier’s biggest yet for the CSeries.